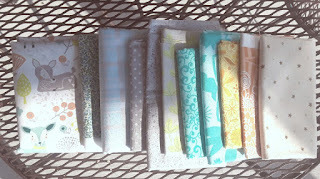 In April, a sweet little friend asked if I made quilts to order for people. Her grandson was in my class years (he's in Middle school now) ago, and her daughter was expecting another grandbaby. She brought me the cute, woodland fabric on the far left and some pretty mint green flannel. On Tuesday, they put the mommy on bedrest because of some complications; we prayed and prayed. We received what we thought was bad news on Wednesday, we cried and prayed some more. This sweet boy arrived extra early, two and a half pounds/ 12 inches long and on Thursday morning, he and his mommy were resting comfortably. Needless to say, my finish goal is scooted up! The top is almost together, lying in my living room floor. Must get to work! SURPRISE!!! Some of us arrive earlier than expected. Myself included. Here's hoping the little one grows quickly so everyone can settle in at home... with the Woodland Quilt that you will finish in the very near future! Glad your story had a happy ending. Good luck with your stitching plans.